For all practical purposes, it's the last week of summer, and that means everyone is in vacation mode. I, on the other hand, am in catch-up mode and have plans for a very productive week. I have a theory that if everyone else is occupied, maybe I can work without interruption. Since it's the last day of the month, it's high time for the August giveaway. Leave a comment. What activities do you have lined up for this last blast of summer? What's in the works for your fall knitting? Is there a pattern you're absolutely smitten with? See below for an additional comment suggestion. yarn - winner's choice. The contest will run through the holiday weekend and will close on Monday, September 7, 2015. I'm starting my work week with a tough decision. It's come down to these three buttons. 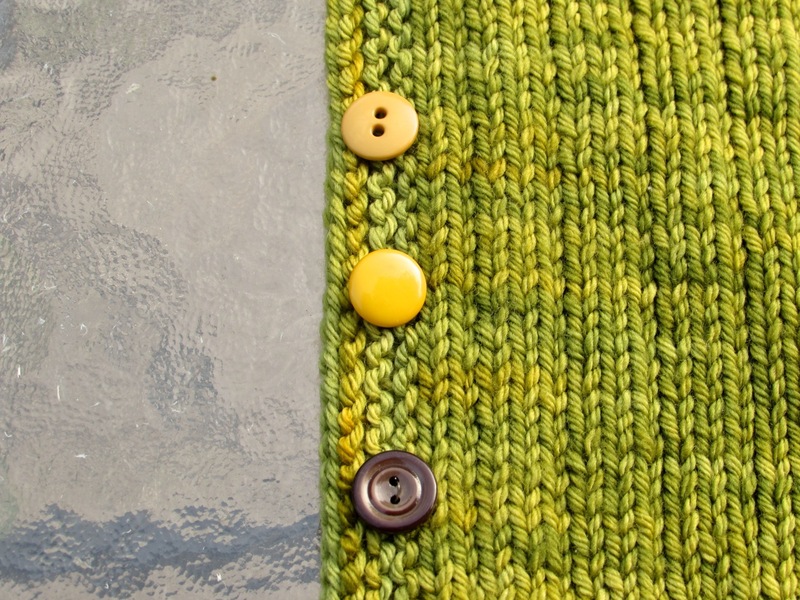 I had decided on one button, but I couldn't leave well enough alone. I had to dig a little deeper in the button box, and now I've confused the situation. Three choices, three different looks, all of them acceptable. I'll probably do an informal poll of family and friends. Feel free to weigh in if you have an opinion. I've been flipping back and forth between two shawl projects. In some ways they are the same, in other ways they are so different. Both shawls are worked from top to bottom but with different construction techniques. My Purpleplexy stitch count has been steadily increasing and now stands at over 350. 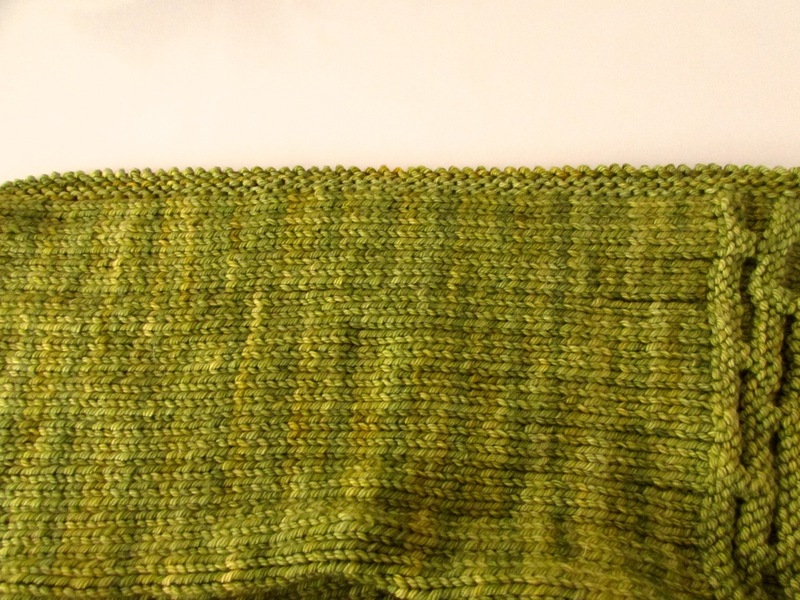 I'm in the middle of another stripe section, so it's a little more time-consuming. Once I finish the stripes, the pace will pick up again. 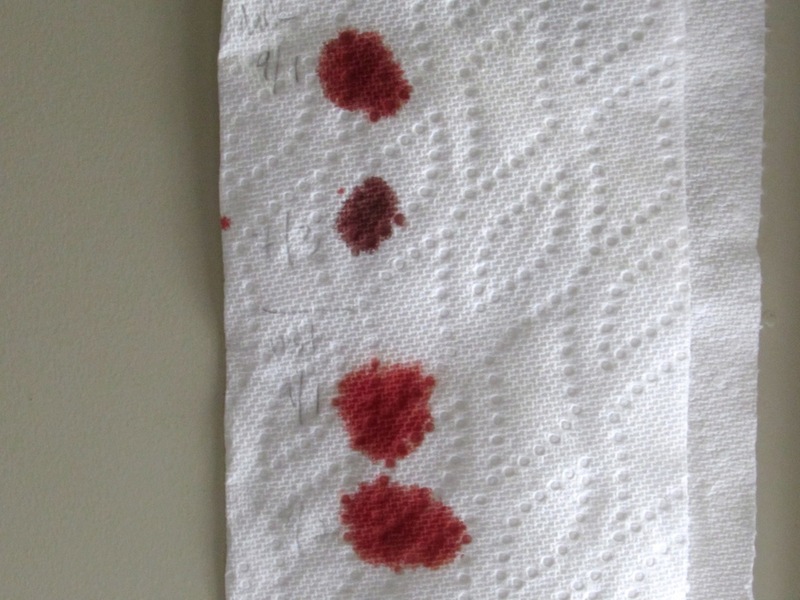 When all is said and done, I'll have over 450 stitches. On the other hand, my Just Enough Ruffles Light seems to be cruising right along. I'm in the middle of 36 short rows. Because the rows keep getting shorter and shorter, it feels like I'm making great progress. And then I read ahead in the pattern - sometimes a good idea, sometimes not. I never recommend reading ahead in a book, but reading ahead in a knitting pattern can be valuable. I'm not sure if the knowledge that the final stitch count will be 768 is valuable information or not. This might be a situation where ignorance is bliss, but at least now I can brace myself. I never let a little bad weather interfere with a planned stop at the beach. This week's color inspiration . . . 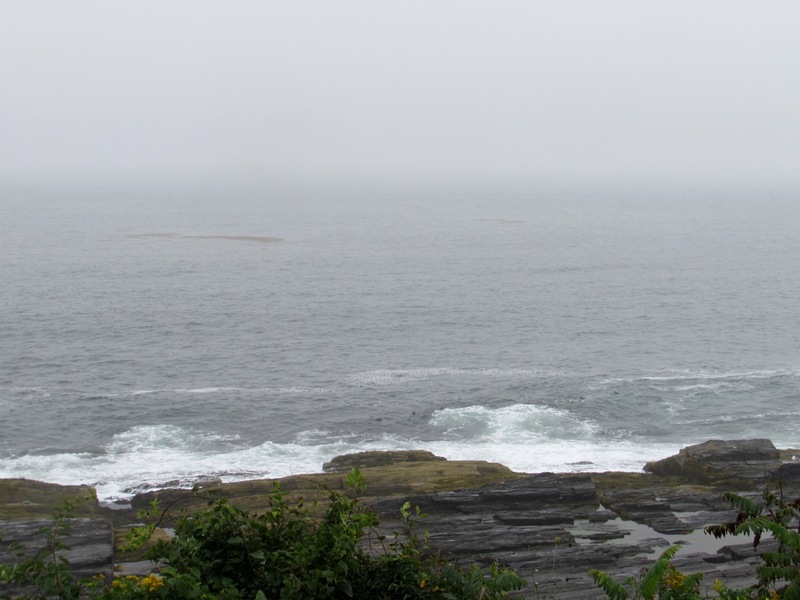 I had a different blog post planned for today, but I decided it could wait. Every day I check in on the news . . . climate change, election campaigns, refugees, unrest in the Middle East, the falling stock market. From my own backyard to the world at large, I try to keep current. Most days the news is not very uplifting, and every once in a while I have to take a break from it all and unplug for a day or two. Often the news is discouraging and disheartening, and I need to hit my reset button. Wouldn't it be nice to have a media outlet that told only positive news stories? In addition to local, regional and world news, I keep tabs on knitting news. Sad to say the news on that front isn't any better. The headlines proclaim more yarn shop closings. How can that be? Knitters are everywhere. The DIY / Maker Movement is strong and includes everything from beer, gardening and cooking to laser cutters and 3D printers. Your local yarn shop - if you're lucky enough to still have one - is a great resource. Are you baffled by that sweater pattern? No doubt someone at your local yarn shop can bail you out. 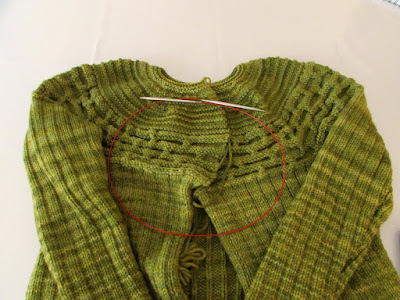 Are you having a knitting needle emergency? It's a good bet your local yarn shop has just what you need. Heaven forbid you should run out of yarn before your project is finished. Don't fret. It happens to the best of us. Your local yarn shop is the place to go. Most important are you looking for community? You can have great fun knitting alone at home, but it doesn't have to be a solitary activity. Head to your local yarn shop. 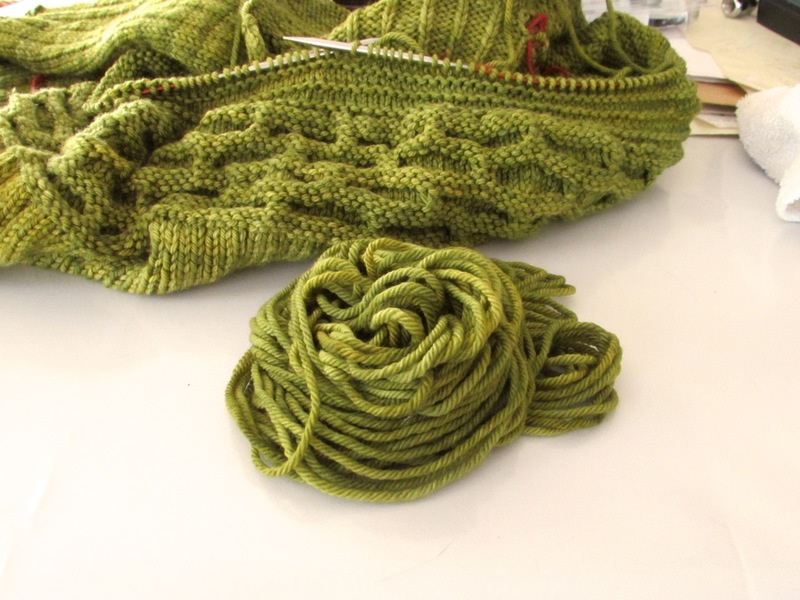 Knit with others, share ideas and inspiration, foster new friendships. Chances are all of that is happening at your local yarn shop. And while you're there, make a purchase. It doesn't matter how much you spend . . . every little bit helps. It's a small price to pay for community building and all the other benefits a local yarn shop provides. Shop local and support your yarn shop. 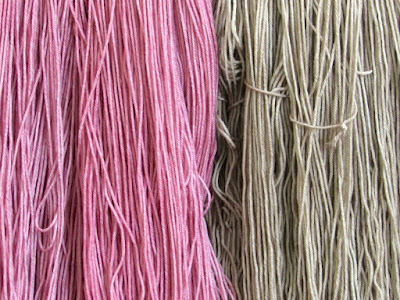 Let's keep yarn shop closings out of the headlines. Playing with colors is part of the fun. 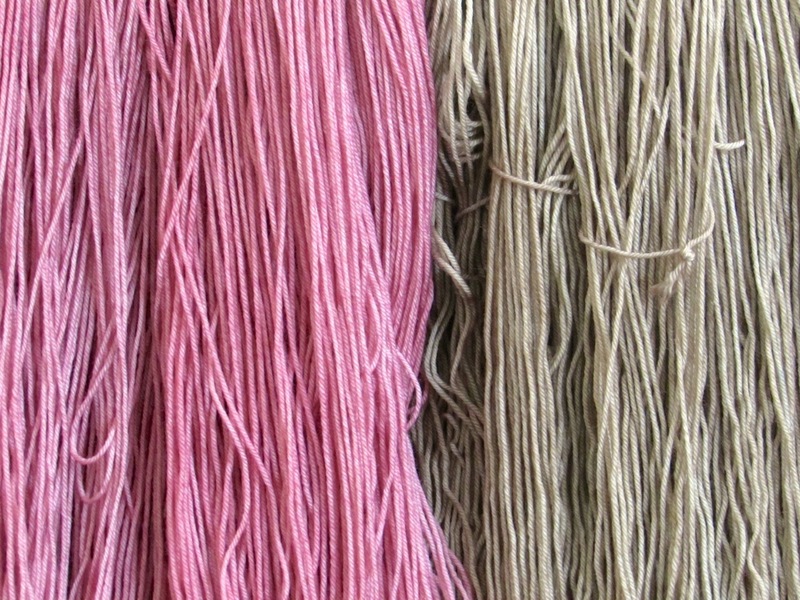 Often I'll set aside time to try different combinations, test ideas and decide which new colors to offer. Here are the results from one doodle session. And this. All of them interesting possibilities. And then there was this. 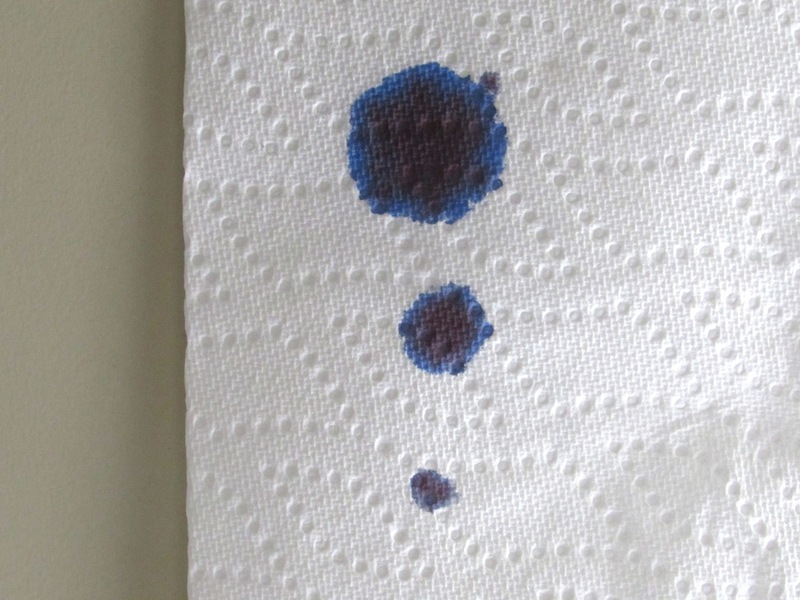 I'm not sure yet where this color is going. I'll have to doodle some more. What happened to the lazy days of summer? I don't think I got my fair share this time around. This week I've been juggling hectic household schedules. The situation was compounded with a trip to urgent care, helping a friend move, getting one kid ready for a week of travel and at the same time getting the house ready for 4 weekend guests. The reality of the situation hit home when I couldn't schedule one night when everyone was available for a family dinner. I give up. Fall is right around the corner, and I've resigned myself to the fact that the frantic pace is already here. I've turned my attention away from a family dinner that isn't going to happen, and instead, I'm concentrating my efforts on prep work for fall. This colorway was an easy choice. I must admit I was tempted by one of my new blue colorways, but it wasn't that long ago that I had 3 or 4 blue projects in the works. I need to balance things out, and Lillian Gourd is a step in the right direction. Sweater knitting in August is not for the faint of heart. We've had some of our hottest summer days this week, but I've persevered. 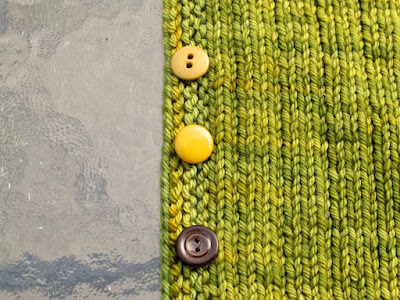 One button band is done except for the bind off. One more button band to go. I'm ready for the my favorite part of this whole process. It's time to pick the buttons. Yesterday morning I was out and about with knitting time on my hands. Since I knew sweater knitting wasn't going to be practical, I left my Washington Square behind and grabbed a sock instead. Flaming Desire. 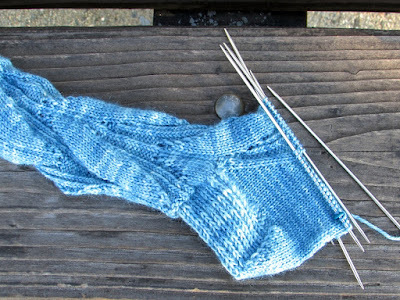 I started the day with a foot to go on the second sock. 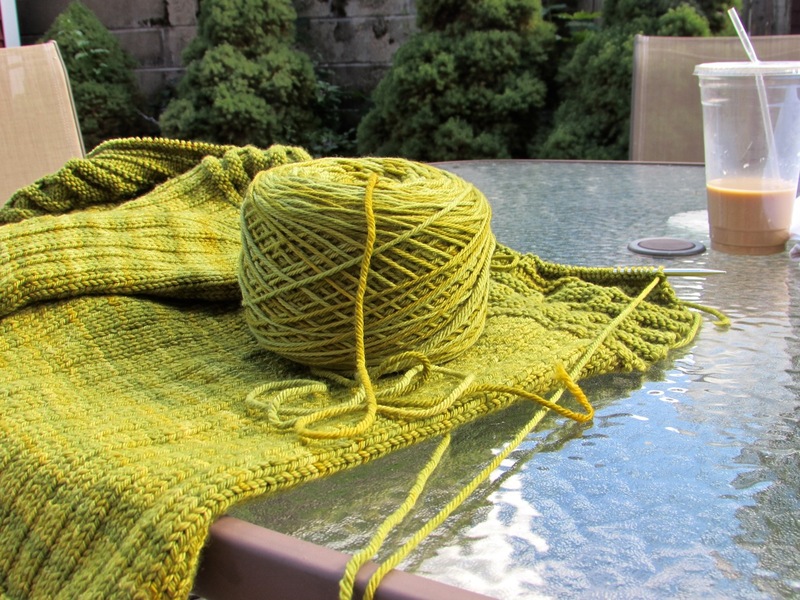 Knitting on a park bench in August can spark some interesting conversations. 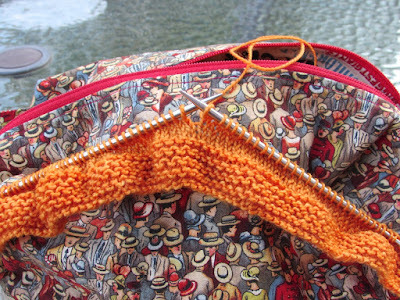 One passerby was joking with me about summertime knitting. When I reminded him that winter is coming, he nodded his head in agreement. My Sunday was filled with a mix of this and that - a bit of dyeing, running errands, coordinating schedules, cooking and baking. Throughout the day, I worked on the sock. At the end of the day, I had a complete pair. It feels like I haven't finished a project in quite a while. Maybe now the momentum is shifting. This design features a lace pattern combined with twisted stitches. It wasn't a completely mindless project, but it wasn't overly taxing either. The yarn is a blend of Corriedale and nylon and isn't part of my regular lineup. 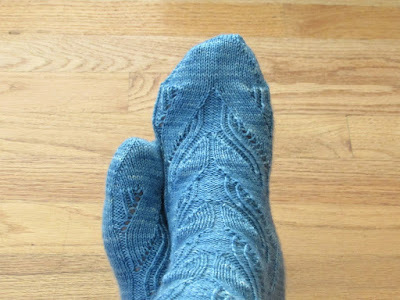 Both the yarn and the colorway were featured this past winter in one of the installments for Yarn Knot Socks. I've used this yarn a couple times and do love it. At some point, maybe I'll bring it back for a guest appearance. A quick update on my Washington Square. I don't know how much time I spent searching for the missing yarn, but in the end it paid off. That's a good thing. Time is precious, and I hate to come up empty-handed. 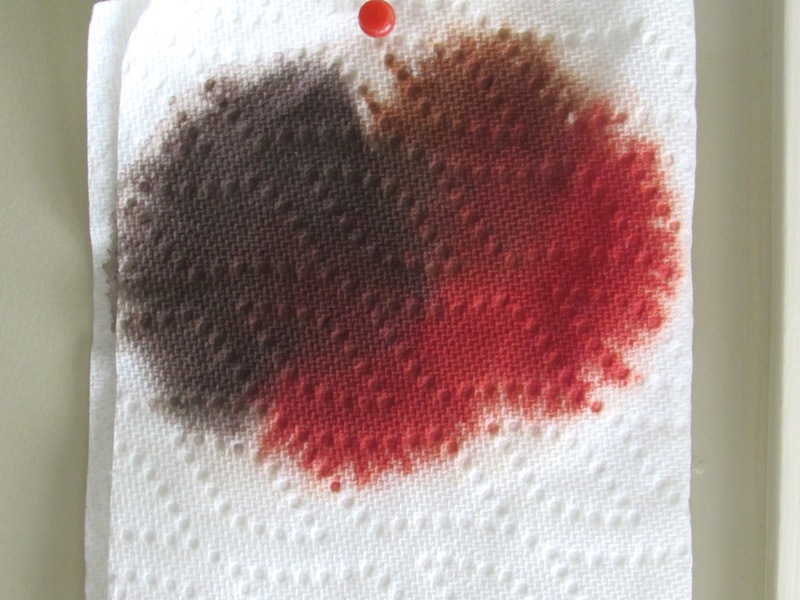 It was also reassuring to know I wasn't imagining the skein of extra yarn. Once I found the yarn, I had a good excuse to put in some knitting time. I think it took me longer to find the missing yarn than to work the last few rows and bind off. Next up . . . button bands and a bit of finishing. It won't be long now. 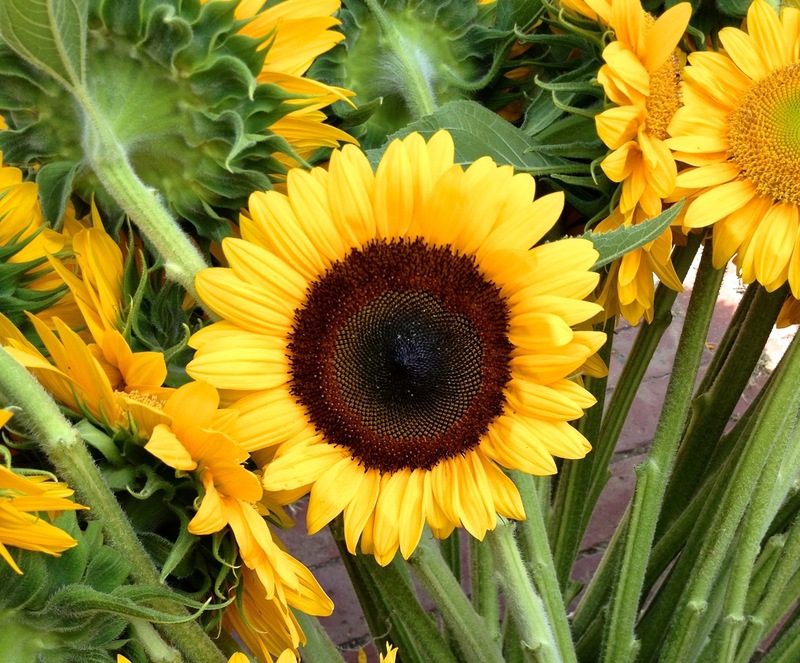 This week's color inspiration . 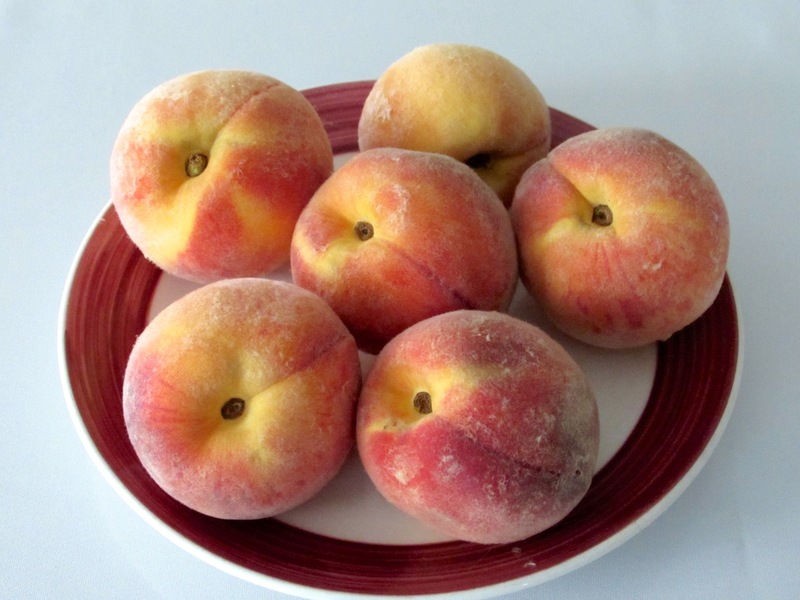 . . peaches. 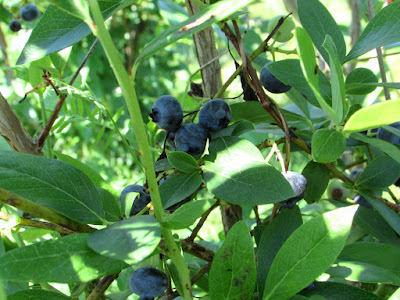 So juicy, so sweet. I bought two bushels of peaches, and we've been eating them in cobbler and sauce, with yogurt and just plain out of the box. I think we're due for a peach pie. A lovely blend of yellow and red. Well, my Washington Square project is stalled. Again. So far my yarn search hasn't uncovered the missing skein. At this point I'm not even sure it exists. In the process of hunting, I did empty a basket that contained a random collection of odd balls and yarn that I had selected for a mitten project . . . a good reminder that winter is coming and I could use more mittens. I thought my stash was pretty well organized, but this search has turned into a good excuse to dig a little deeper. I'm not feeling defeated. Today I need to give the house a quick tidy - notice the operative word quick - and I hope that momentum will carry over to the yarn search. It might be time to entertain the notion of a Plan B. My theory is that if I have another option brewing, the missing yarn will turn up. While I consider the options, I can work on this. Flaming Desire, the second sock. 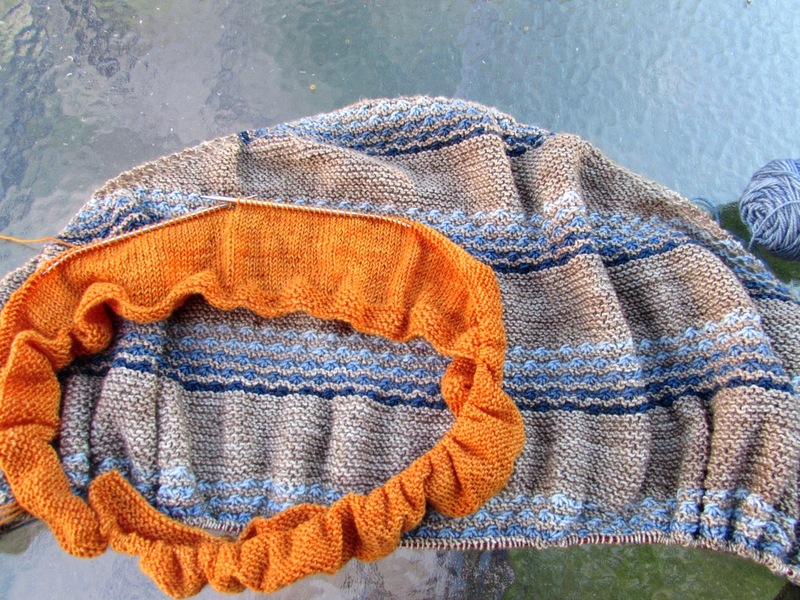 There are plenty of other projects in the works, and I'm not going to sit idle waiting for a skein of yarn to surface. The good news. Over the weekend I didn't have an abundance of knitting time. When I did have a chance to knit, I made a concerted effort to work on my Washington Square. The yoke isn't finished yet, but I can definitely see the light at the end of the tunnel. The bad news. I'm using the last little bit of yarn that was tucked in the bag with this project. 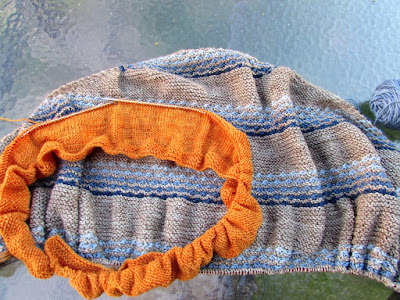 When I brought this sweater out of retirement, I had hoped there was enough yarn to finish the yoke. Obviously my calculations were overly ambitious. 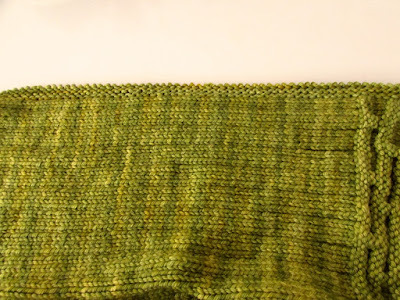 This project had been marinating for a while, and the yarn details are a little foggy. 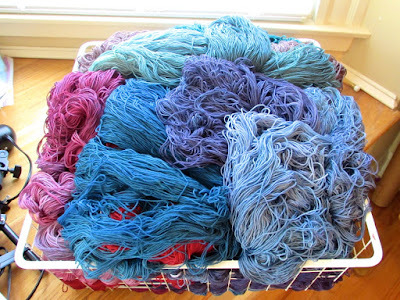 Is this all the yarn I dyed for this project? Maybe that's the reason I set it aside. 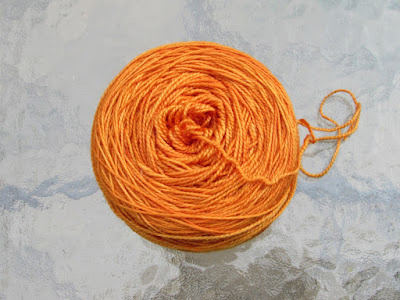 Or did I stash away another skein for "safe keeping"? Today I'm going to conduct an all-out search. While that problem percolates, I'm enjoying random color combinations on the drying rack. activities . . . summer will do that. The lazy days are slipping away, and I've noticed the daylight is already getting shorter. In spite of the distractions, I'm trying to keep my knitting time focused on Washington Square. 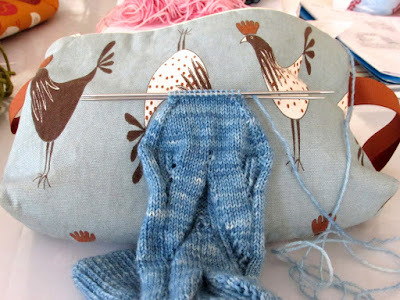 I've started the yoke decreases. Like the daylight, the long rows are getting shorter. 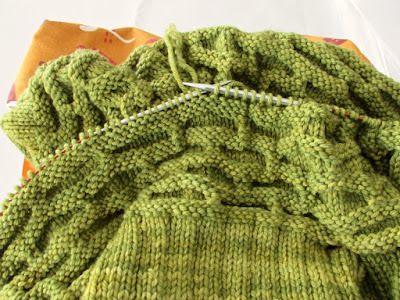 I'm anxious to get this sweater off the needles, and shorter rows will definitely help in that effort. I haven't started browsing for my next sweater pattern yet. Maybe after a few more rows. Blueberries . 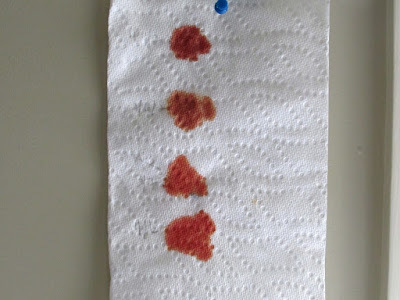 . . my color inspiration for this week. Dyeing is only part of the process. This is one of the yarn piles waiting for finishing touches. These skeins need twisting and labels, and then they're out the door. Maybe they're headed to a yarn shop near you . 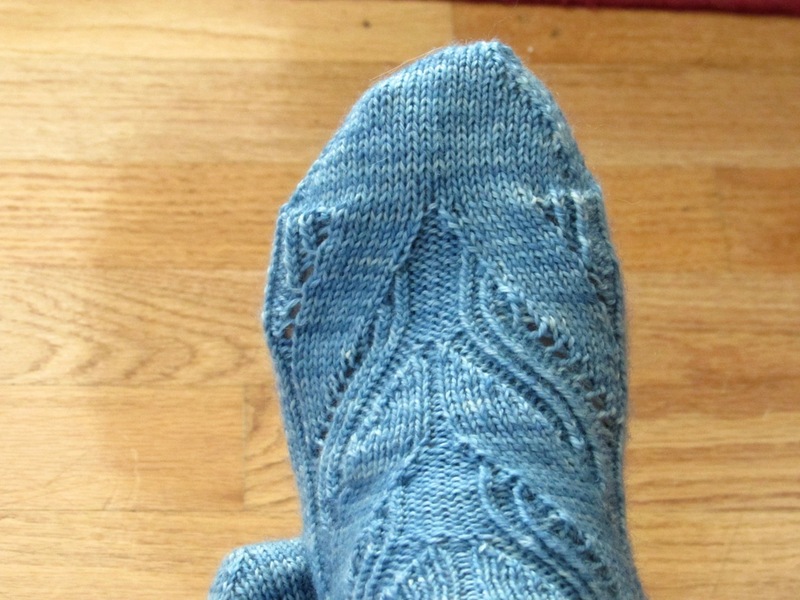 . .
On Friday night I finished knitting a sock. It was late and my eyes were tired, so I decided to save the Kitchener stitch for morning. Fast forward to Monday morning, and my sock is still on the needles. It would have taken me all of 5 minutes to close that toe. Oh, summer. The season of impromptu gatherings with family and friends. 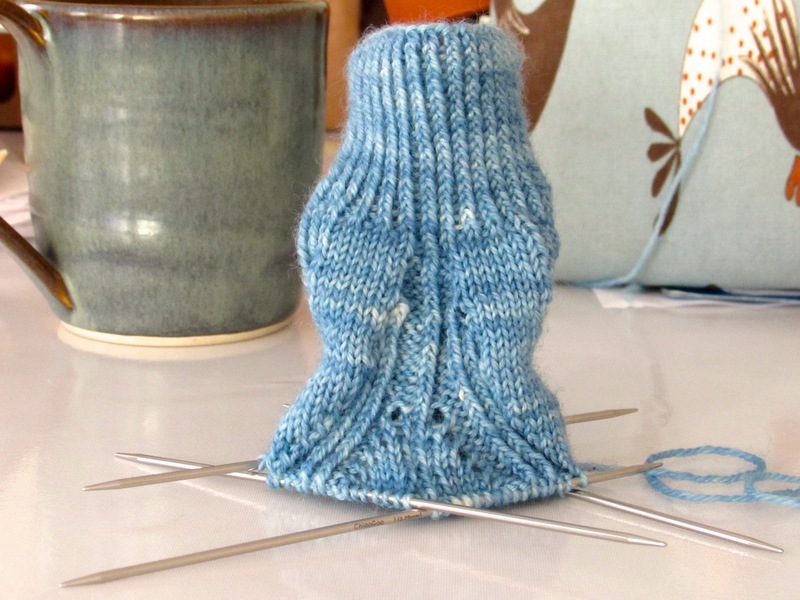 Since I didn't get this sock off the needles over the weekend, it's near the top of today's to-do list. But first things first . . . wrapping up the July giveaway. Thanks for all the comments and suggestions. The common thread is knitting in front of the TV and having a designated knit night with friends. Many of you are also knitting just a few rows here and there. It all adds up. I must confess I'm in the same camp as Lee when she says, "I have been known to even pull it out at a red light to help calm me!" Congratulations to Laura. She's the July winner. As an aside Laura is traveling to Akron this month and is looking for yarn store suggestions. Give a holler if you have any recommendations.